I’m sure that most of you are on tenterhooks, anxiously awaiting the results of the Great Wood Movement Experiment of 2009. And, yes, I did promise that about two weeks ago, I would have the results. However, a little thing called ‘Life’ got in the way. My timing was terrible. My two confederates in this project – Dave Campbell and Marc Spagnuolo – both had things that kept them away from measuring the sample boards I had sent. For Dave, it was a family camping trip that set him back a day or so. For Marc, I must have been clairvoyant. I sent him the boards smack in the middle of a move between houses. No wonder it took some time to get the results back. Dealing with power, phone and cable companies takes time! 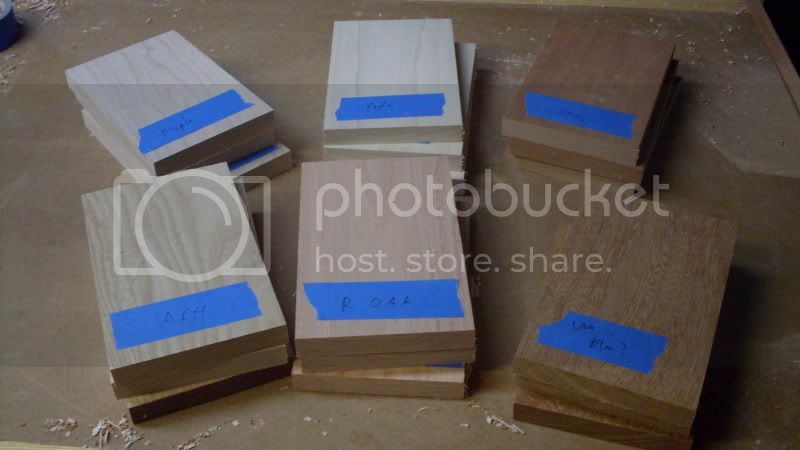 I had prepared some samples of commonly used boards in cabinetmaking – cherry, poplar, hard maple, ash, red oak and a mystery board which looked a lot like elm. All were 5″ wide by 8″ long and were shipped to my victims – errr – volunteers by USPS Express Mail. Dave Campbell is the deputy editor of Wood Magazine, and calls the Des Moines, Iowa area home. Marc Spagnuolo is the Wood Whisperer himself, and has bounced between two homes in the Phoenix, Arizona area for the past few weeks. Both of these guys let their packet of sample boards aclimate to their shops for about two weeks. I kept a third set of boards here in my Tampa, Florida area shop in the stifling heat and humidity. Also, none of the boards had appreciable expansion along their length. This was the expected result because wood doesn’t expand dramatically along the length of the fibers. Of course, the next time I do something like this, I will cut the boards 5 inches square, so we can fit calipers across both dimensions…. Live and learn, right? Tampa was its typical summer-like self. The weather was exceptionally rainy at the start of June, and the added humidity made going into the shop a challenge. Des Moines saw the passage of a frontal system which not only brought rain, but severe weather as well, with the touchdown of at least one confirmed tornado. As with Tampa, Phoenix was enjoying – if you can use that word with a straight face – its typical hot and dry weather, with a dew point which seems just way too low for someone living in Florida. Since Des Moines’ dew point was higher that its normal levels due to the increased rain, Dave’s samples had considerably less movement than I had expected. In many cases, the difference between widths was mere thousandths of an inch – something which could easily be accounted for given my faulty saw setup. However, Marc’s numbers were considerably smaller than the samples kept in my shop. Going from the near tropical conditions in Florida to Phoenix’s desert, the boards gave up their moisture content to equalize with the surrounding environment. The ash sample was dramatic, shrinking nearly 1/8 of an inch across a five inch wide board over the two week period. Even with my faulty science and measurement techniques, hopefully you have been able to see that yes, there is definitive evidence to suggest that wood does move over its width with changes in humidity. This expansion and contraction does have to be accounted for in your construction methods, or the boards will crack or push apart the joints. Floating solid wood door panels and table fasteners are some of the time-honored techniques for handling these expansions and contractions. All I can say is that the Great Wood Movement Experiment of 2009 has been a moving experience for me. I have to move myself out to the shop to get that saw tuned up! This is very useful and thank you for thinking about doing this. Now, I have suggestion to take this to the next level. Why not track these same exact pieces though the seasons? I have had a lot of problems with alder doors moving some times 1/4″ on 36″ entry doors and the wood movement is to me more important than design. The joints are not going to be any good if this beautiful material keeps moving on us. Wow! 1/8″ on a 5″ board. That’s amazing. Yeah – definitely an interesting experiment. I’ve got some other plans for cool experiments planned for the future. This could be fun! I notice Ash is pretty stable in spite of high rel. humidity. That can be helpful here where we have large seasonal changes. I have a set of french double doors that in the winter have a good 1/2″ gap between them, and now that it’s been raining and decently got, they touch when closed. Sometimes you can barely even get them closed. This on Long Island, in New York. I’ll be interested for sure to see the results for finished samples. It sure seems like a shell of polyurethane would keep the moisture out (or in), but who knows. While you’re at it, I’d also like to see the same experiment run on MDF, plywood, and particle board. I believe these are all considered to be more stable than solid wood, but are they really? And if so, by how much? I will say this about MDF. I bought a 4x8x3/4 piece of MDF at a local lumber yard and they loaded it into the bed of my truck. When I got home the piece was actually stuck in the 4′ wide opening between the wheel wells of my truck. The MDF had been stored in an outside situation. I never measured the MDF nor did I measure the distance between the wheel wells; but I would say that the piece of MDF was between 1/2″ and 3/4″ wider than it should have been. You mean the MDF expanded? Wow, that’s pretty cool! I thought what is called 4 foot wide MDF board is actually 49″ wide. Tom,thankyou for letting in your feedbunk,lol burner.That was a very wise test.I built a rolltop desk out of ash for my daughter here in Iowa in 2004,it was a beauty,still is but they moved to Las Vegas in July of 2005.Temps were 110 with 7 to 10% humidity.She called one morning in september stating theres a crack in the desktop,she was heartbroken thinking they did something wrong.but tried to asure her it wasnt anything they did.And thought it had it be the humidity.Its hard to believe but when we visited them in Oct.the crack was about 3/16s but not very noticeable,so thats how its stayed. Seal test boards with shellac – all sides, one side and end grain, one side only. Finish another set with BLO, no shellac. Another board with waterborne lacquer (all sides). Keep it over one season. Also, measure waterborne-finished board immediately and after some 2 weeks.